הדפיס את ספרי נפש החיים. Interesting. According to Farshlufen, Israel Rogosin paid for the purchase of the Nitra Yeshiva property – Initially the $85,000 was given (to Reb Michoel Ber Weissmandl zt’l) as an interest free loan but later waved, cool. He came to America to collect money for the Yeshiva in Volozhin. Aron, thanks for the info, Rav Shmuel shechter married Chava the daughter of R’ Yitzchuk Duv Gordon who was the son in law of R’ Shulem Eliezer Rogosin Z”l. R’ Yitzchuk Dov sent his sons who were born in New York to learn in Mir. 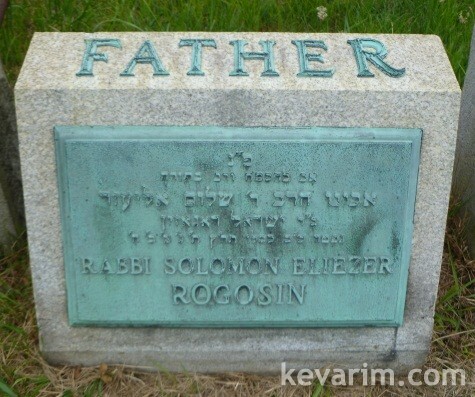 The sons who learnt in Mir were my father, Harav Eliyahu Moshe, the bechor and first to go. My father who was a chavrusa of Rav Chaim Scheinberg, was part of a group that learnt in the New Haven led by Harav Yehuda Levenberg. Many of those talmidim went to learn in Mir, Poland. Upon his return,Rav Eliyahu Moshe became a shul rov and Magid Shiur in Chaim Berlin. the middle son was Rav Yehuda “Yudel” Gordon who arrived in Mir while his older brother was still there, remained after his elder brother left and spent part of his stay together with his younger brother Shlomo. In the famed book on Harav Hagaon Harav Boruch Ber zt”l, “Harav Hadomah l’Melech” there is a picture on page 266 of Harav Boruch Ber, together with 3 talmidim standing behind. the three are R’ Yaakov Moshe R’ Chaim Sholom. The third and tall talmid in the picture is my uncle, R’ Shlomo Gordon and NOT R’ Chaim Avraham Pincus. The picture was taken by his older brother, R’ Yudel Gordon. In the famed book on Harav Hagaon Harav Boruch Ber zt”l, “Harav Hadomah l’Melech” there is a picture on page 266 of Harav Boruch Ber, together with 3 talmidim standing behind him. the three are R’ Yaakov Moshe and R’ Chaim Sholom.